Summer is here at last, and what better way to celebrate than by getting outside and running around? While most of my kids' time outdoors is spent in free play - digging in the dirt, taking pictures of flowers, creating sidewalk chalk works of art, making dandelion roadways for their cars, or picking buttercups (affectionately called "yellow chin flowers" around here, so named for the way they turn your chin yellow when held underneath) - they love a good family game of organized tag, too. I play these games with the boy (five years old), the toddler (two years old), and sometimes the two-year-old daycare child and/or the husband. You might think 3-5 players is too small for some of these games, but they love our slightly modified versions all the same. Today we're celebrating the hope of warmth and sunshine by sharing some of our favourite variations of tag! 1. What Time is it, Mr. Wolf? This counting version of tag is one of our most frequently played yard games. It is suitable for our range of ages, allows full participation for all the children at the same time, and the build-up as the game progresses is thrilling for them. For the first few times, the wolf replies by calling out a time ("three o'clock!"). The players then take that many steps towards the wolf before repeating the question. Eventually the wolf calls out "dinner time!" instead, at which time the wolf chases all of the players back to the starting line. Either the wolf tags them before they reach the line, or they reach the line first and are "safe". Traditionally, the first child tagged on the chase back to the starting line becomes the new wolf. Because of the makeup of our small group, I usually remain the wolf and the game begins again. This classic playground game was my favourite as a child, so I was thrilled when it immediately became the most requested variation of tag after introducing it to my own boys. While this game is typically better suited to a large group, we find it works just fine with our own group of 3-5. In our small group version, the kids take turns being the person who will be called over. The rest of us line up on the other end of the yard, holding hands, and call out the familiar chant: "Red Rover, Red Rover, we call [name] over!" The child called then runs across the yard towards us and tries to break through our linked hands. He either succeeds or he doesn't; either way, he joins the line and the next child heads across the yard to await his turn. We cycle through the children in this way until they're ready to move on to something else. The street light turns their back on the other players and yells "green light! ", an invitation for the other players to begin running towards the street light as fast as they can. The street light then calls out "red light!" and quickly turns around. The other players must freeze as soon as they hear "red light"; any players still running when the street light turns around are sent back to the starting line. Play is repeated until a player reaches the street light and tags them. This player then becomes the street light for the next game (or, in our case, the street light remains the same and the kids go back to the other end of the yard to begin another round). Another childhood favourite of mine, British Bulldogs places the person who is "It" in the middle of the yard. The other players line up at one end of the yard and, when given the signal, attempt to run en masse to the other end of the yard without getting caught by the bulldog as they pass by. With a large group, the players who are caught become bulldogs themselves, and play continues until only one person remains free. With our small group, the first person caught becomes the new solo bulldog for the next round. Perhaps more appropriately called "wrestling", this is the boy's favourite version of tag. The object, if there is one, seems to be to tackle or otherwise knock each other to the ground. There is no single person designated as being "It"; everyone simply chases and wrestles with each other. Because there are no rules, every round is unique, but they all typically involve a great deal of running, lunging, dodging, chasing, grabbing, tickling, and roaring. The toddler is, unsurprisingly, not a fan of this game, but he loves it when I hold him in my arms while chasing (and being chased by) the boy. Linked up at the "Summer Fun for Children" NPN blog hop at Child Organics. We played a similar game to "British Bulldogs", called "Octopus". The person in the middle was the octopus and would call out "Come in, little fishies!" and then all the kids would run from one side of the yard to the other. Here's the twist: if you got tagged, you had to hold hands with the octopus, and now you're both the octopus. You had to work together to tag people to add to the octopus, but the first octopus was always the "head", so the decisions were ultimately theirs to make. When we played in gym class, there was a limit to how big the octopus could get, but when we played at recess, the octopus could get pretty big. This is a really fun post. Outside play is at it's peak right now- perfect timing. 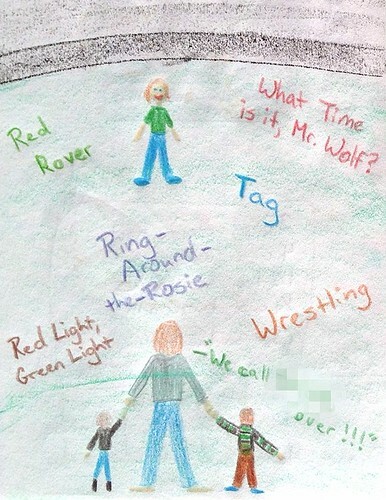 I'm excited to share "What time is it, Mr Wolf?" with my kids. Thank you for sharing this with the NPN blog hop.